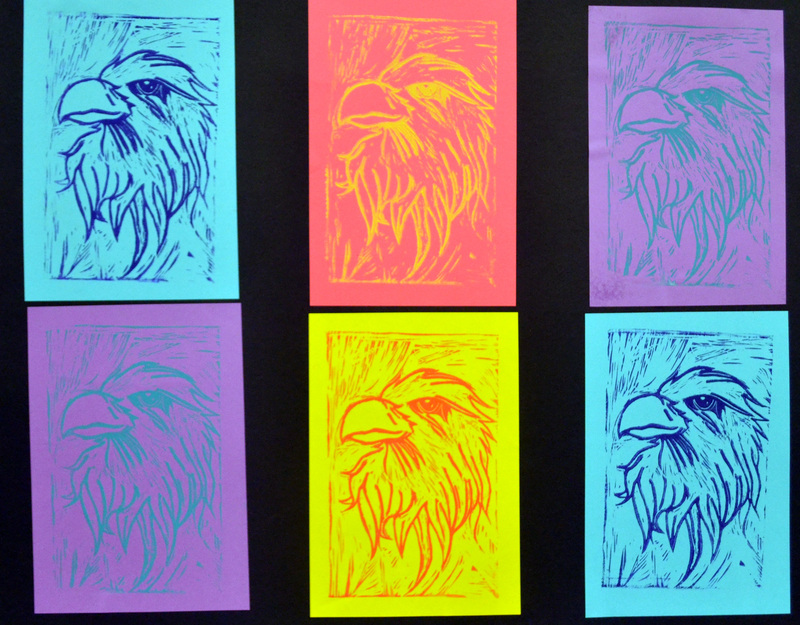 At the end of the quarter, fourth grade art students created Independent Projects by choosing their subject and medium. For whatever weird scheduling reason, the third quarter is a little longer than the others. I decided to use that time to encourage my fourth graders to express themselves creatively through Independent Projects. I’ve done this kind of assignment with high school students, so I was interested to see if my fourth graders would embrace it or feel overwhelmed. They blew me away with how much ownership they took of their projects! I started the assignment by reviewing subject and medium. I reminded them of the difference between abstract and realistic. Then I put up a list of all the materials we had used throughout the quarter. They were able to pick just one or several materials for their project. 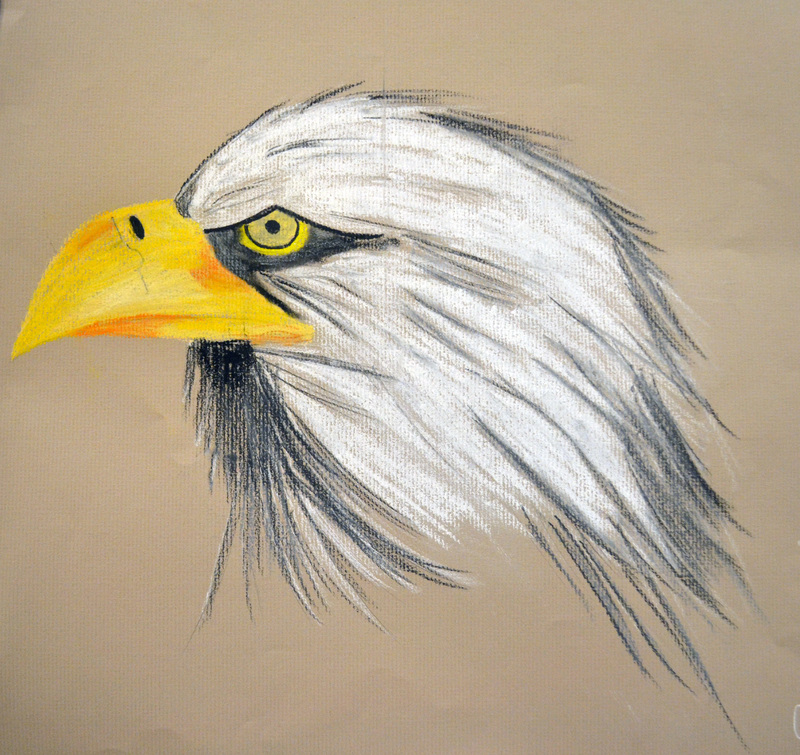 The first step was sketching, which they did directly onto their final paper. I was so excited by the way their ideas bubbled out of them. You could feel the creative energy in the room! The wide range of ideas was incredible and seeing the students work together to problem solve and brainstorm warmed my heart. I had the art supply options set up at the front of the room, so the most intense part was getting each student the appropriate kind of paper. I had stacks of poster board, drawing paper, and printmaking paper ready to go. After they had written down their subject and medium, I would check in with them and give them the paper they needed. Several students in each class decided to do mixed media. They had to plan what order they should use the art supplies. If they needed to wait for one step to dry, I had them work in their sketchbook for the rest of class. 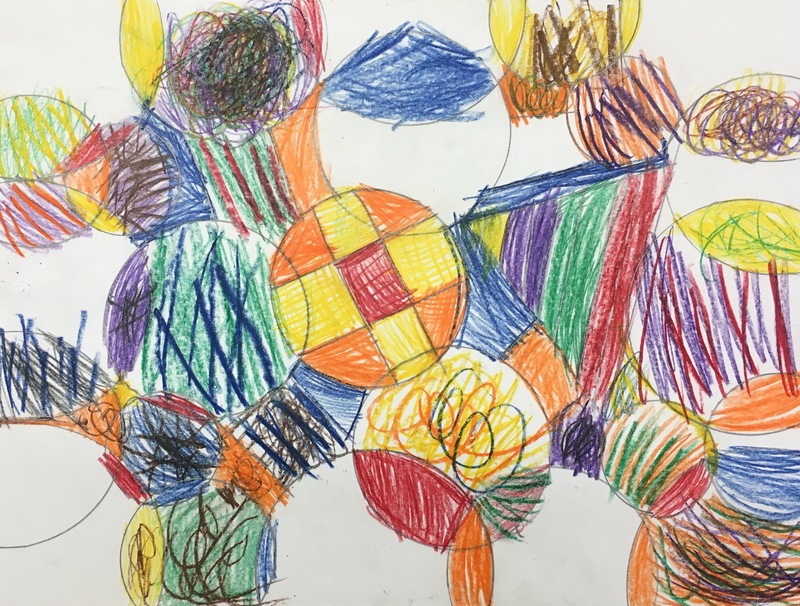 If a student had a hard time getting started, asking them if they’d rather do an abstract or realistic piece of art was usually enough to jump start their thought process. It was also fun to watch them be inspired by each other’s artwork. There were definitely some trends that ran through each class period. The timing was a little tricky; there were about 3-5 kids in each class that finished much earlier than everyone else. Luckily, the assignment lends itself to further exploration. If there was enough time left in the week, I let the student go ahead and start another Independent Project. 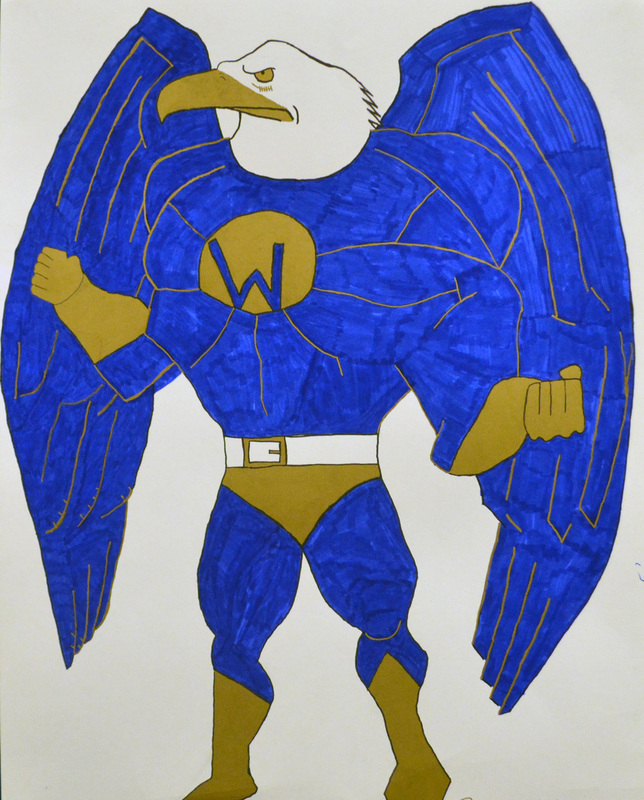 They could decide if they wanted to stick with the same medium and subject or if they wanted to change it up. Third grade art students created three dimensional monsters by painting their design onto a cardboard tube, then hot gluing “extras” onto their artwork. I like to finish the quarter with a project that introduces my students to the difference between 2D and 3D art. I don’t have a kiln this year, so I decided to create a project using materials that were easier to work with. After reading this post on Redefine Creativity, I knew that creating monsters out of toilet paper tubes would be a great fit! I sent out an email at the beginning of the year letting teachers know I was collecting toilet paper tubes. I also told my students that they could donate them for an art ticket. I ended up with enough tubes to last 4 years! After drawing it in pencil, they trace over the lines with Sharpie. This step is essential! Painting such small details on a curved surface can be tricky. Having the bold lines helps to keep the design from getting lost. 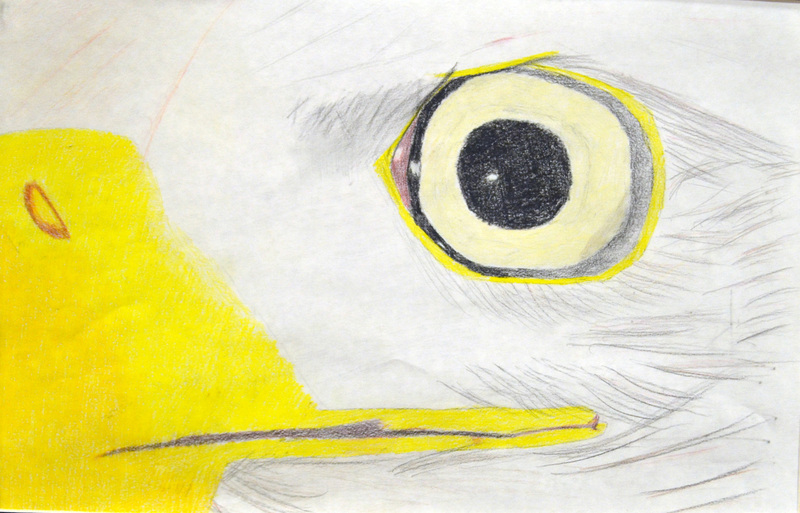 This project goes fairly quickly, many students will be done tracing by the end of the first class period. I let them work on an old sketchbook project and then we all start paint on the second day. Most students finish painting on the second day. After the paint dries over night they are ready to add their “accessories” on the third day. Some students will still need to paint on the third day. I usually have them choose the “extras” they want to add on and then help them hot glue it during an Art Centers day. A sketchbook project is essential to having Hot Glue Day go smoothly! For this project, their prompt is to draw and color their monster’s family. I have 4 “shopping baskets” and I tell the students I will choose who will “go shopping” first based on who is focused on their sketchbook project. Each student brings their painted monster tube and chooses 7 items that they want to add to their monster. They can choose 7 different things or they could decide that they want to have all 7 items be the same thing. At the beginning of class I show everyone a couple of techniques for taping some of the objects on. I stand at the front of the “shopping” line and help each student hot glue the things that can’t be taped. Past the hot glue station, I have a tape station, so that students can tape down the feathers and wires while I’m still close by in case they run into any problems. Initially, I felt like this project was a little too “crafty” for my taste. But after seeing how well it reinforced the idea of three-dimensional art, I’m glad I tried it out. There is so much room for each student to think creatively; it’s exciting to see how unique each monster is. The kids really look forward to doing this project and they love seeing all of their monsters on display at the Showcase at the end of the quarter. 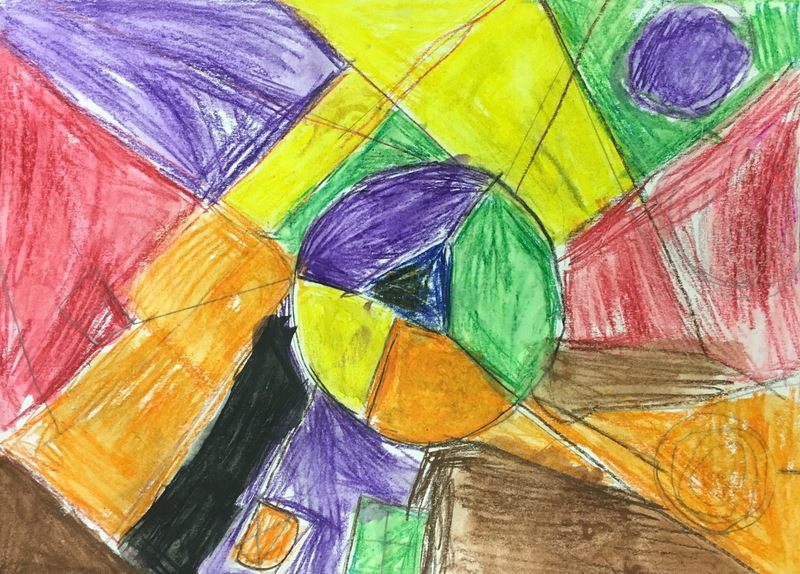 Inspired by Paul Klee’s artwork, second grade students used watercolor crayons to create artwork with geometric shapes. This quarter I have the 2nd graders that I had at the beginning of the year. I have been looking forward to expanding the curriculum to projects that go beyond one day and use materials other than crayons, markers, paper, and glue. I showed my students examples of Paul Klee’s artwork. 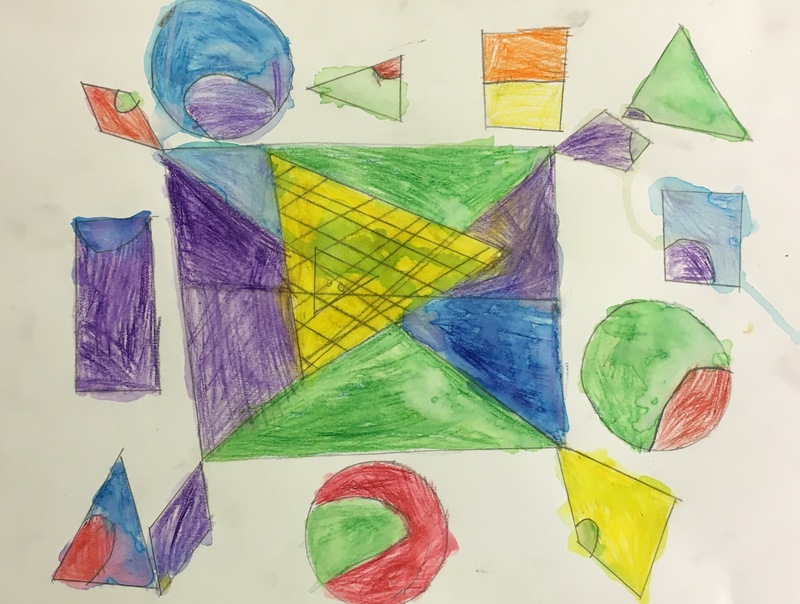 On the first day of the project they drew shapes all over their paper with pencil. I gave them the option of using rulers or circular lids to trace. They could free hand other shapes if they wanted. 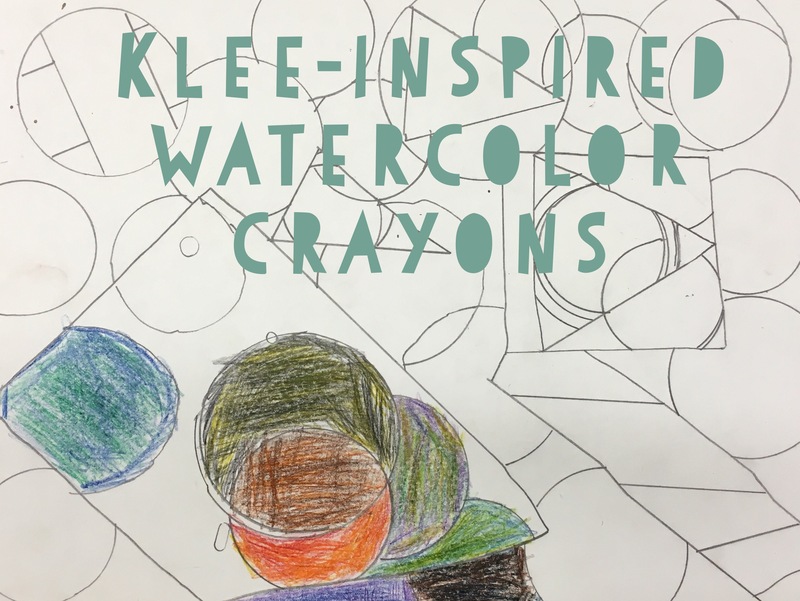 I demonstrated how to color in their shapes using watercolor crayons. A great way to encourage 2nd graders to take their time with coloring is to have them trace a shape before coloring it in. I also explained that they could make “artist choices” about pushing down hard or soft and blending different colors together. On the second day, I showed them how to paint water over their shapes that had been colored in. We used the same technique of painting the outline first and then painting the inside. I reminded them to rinse their brush in between colors. They were super excited to start painting; there were definitely gasps of amazement when they saw the crayon turn into paint! On the last day of the project, about half of the class was already finished with their Shape Painting. I started class by having those students work on a sketchbook page. They could draw anything they wanted and use supplies from the Supply Station to color it in. I will staple all of these drawings to create a sketchbook and display them at the Showcase at the end of the quarter. After the class had settled in, I passed out a piece of cardboard to each table for our collaborative project. We prepped the cardboard and they worked together to paint it once they finished their Shape Painting. I was nervous about combining two projects into one class, especially for 2nd grade, but it went smoothly as long as I made my expectations clear for each transition. 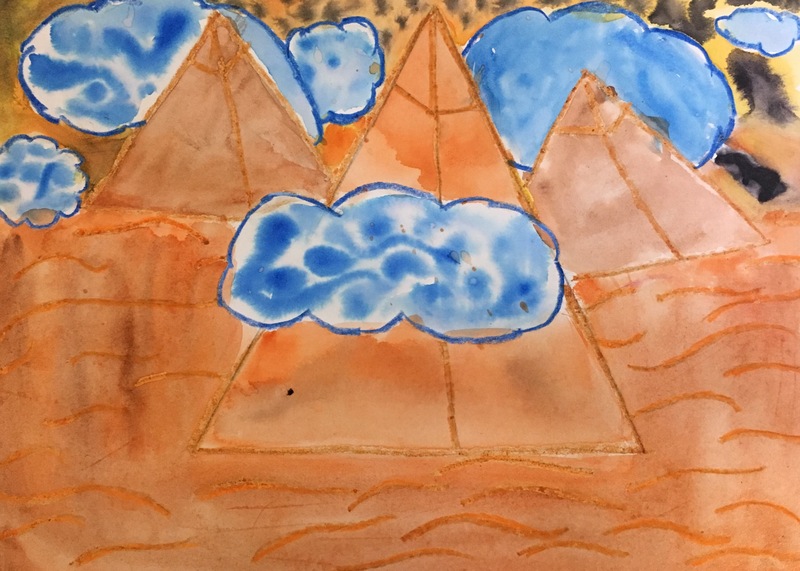 Inspired by James Rizzi, fourth grade art students drew landscapes or cityscapes in crayon, then painted their art with watercolors to create a wax resist. I love love love the first painting project with a class! For 4th graders, I have discovered that wax resist is magical. 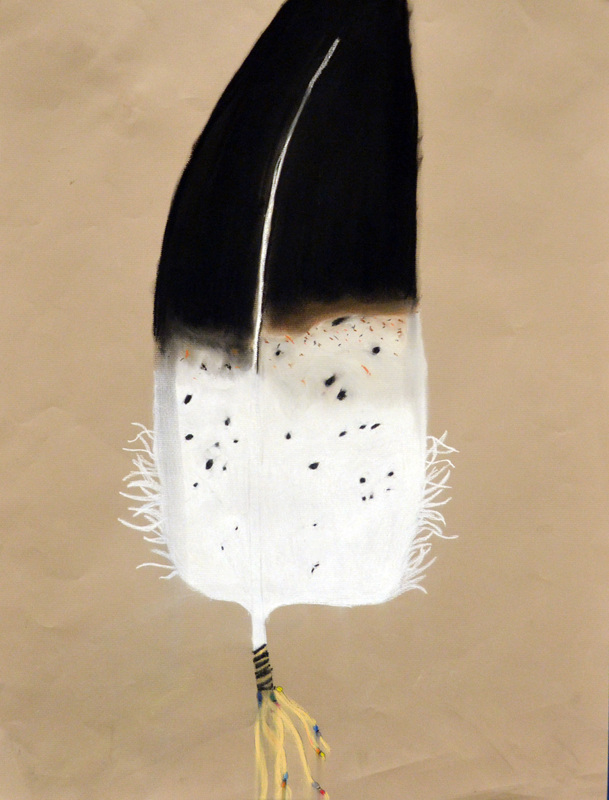 It introduces my students to watercolor, and gives their work some structure. The crayon outlines help to define what could easily be a messy first attempt at watercolors. 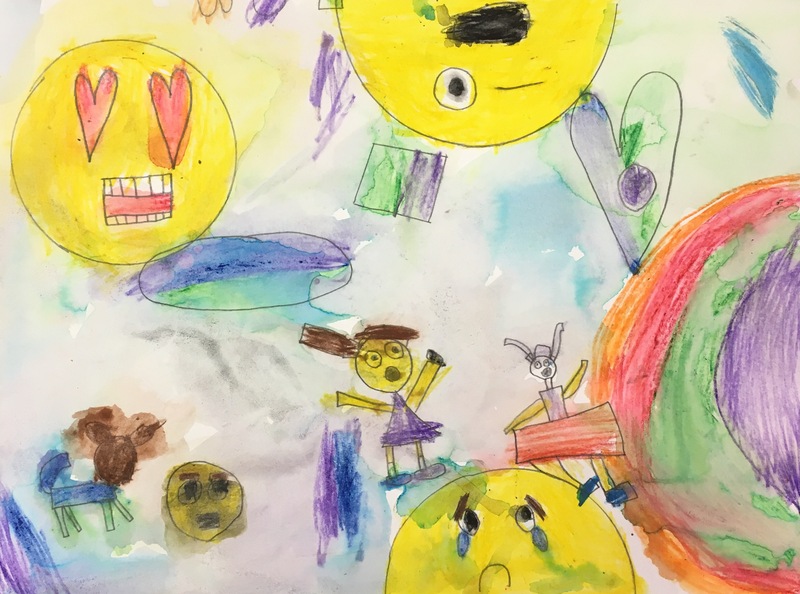 I began the lesson by having my students observe a painting by James Rizzi and discussing what types of personalities they saw in the artwork. They shared their answers and we talked about how the artist showed those personalities. I got the idea for this project from Deep Space Sparkle. I wanted to broaden how my students could interpret the assignment, so I let them choose if they wanted to create a seascape, landscape, or cityscape. They got to decided if they showed personality by adding cartoon faces or doing something different, like choosing their colors based on what personality they were trying to show. We spent the first day sketching and tracing over the sketch with crayon. I did a demonstration to show them how important it was to push down hard with the crayon. Then I showed them two watercolor techniques: wet on dry and wet on wet. It is always so much fun to wow them with the magic of colors mixing together! In one class a student asked if they could do an outer-space scene. I said “Of course!” That idea took off like wildfire, almost half the class ended up doing something related to outer-space; it was a great opportunity to teach them how to use a compass. I was so excited by the results, I’m going to add it as an option in the PowerPoint for next quarter’s classes. I felt like this project really hit the sweet spot of everything I want in an assignment. 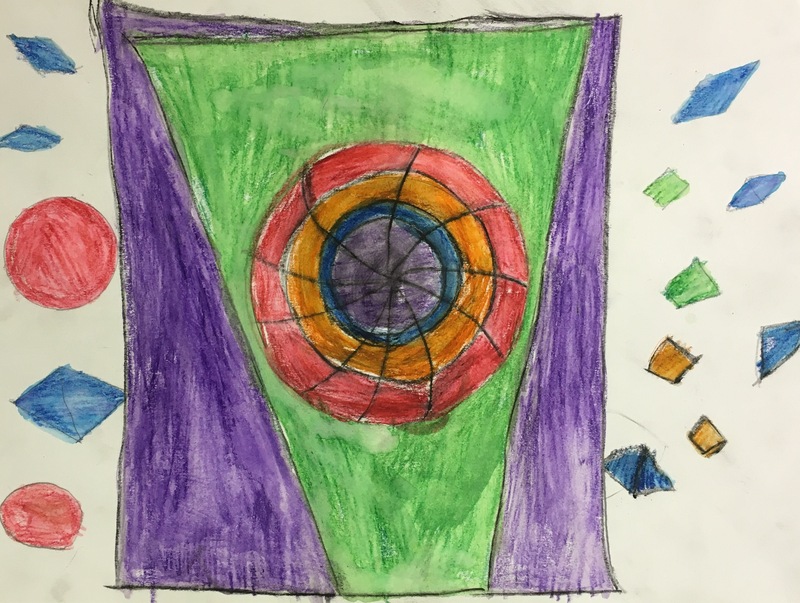 My students learned about an artist, got experience with new materials and techniques, and they were able to express themselves creatively in all kinds of different ways! This one is a keeper! The perfect introduction to printmaking – second graders trace and cut out their hands, then stamp their hand-print onto their artwork. Teaching creativity is almost an oxymoron. How can you teach something that inherently has to come from within another person? My goal this year has been to encourage creativity by presenting projects that are open-ended and allowing students to take their artwork in a new direction. This hand-print project combined cutting, gluing and printmaking in a way that my 2nd graders could finish it in one day. It also turned out to be a great way for my students to make their own decisions about their artwork. 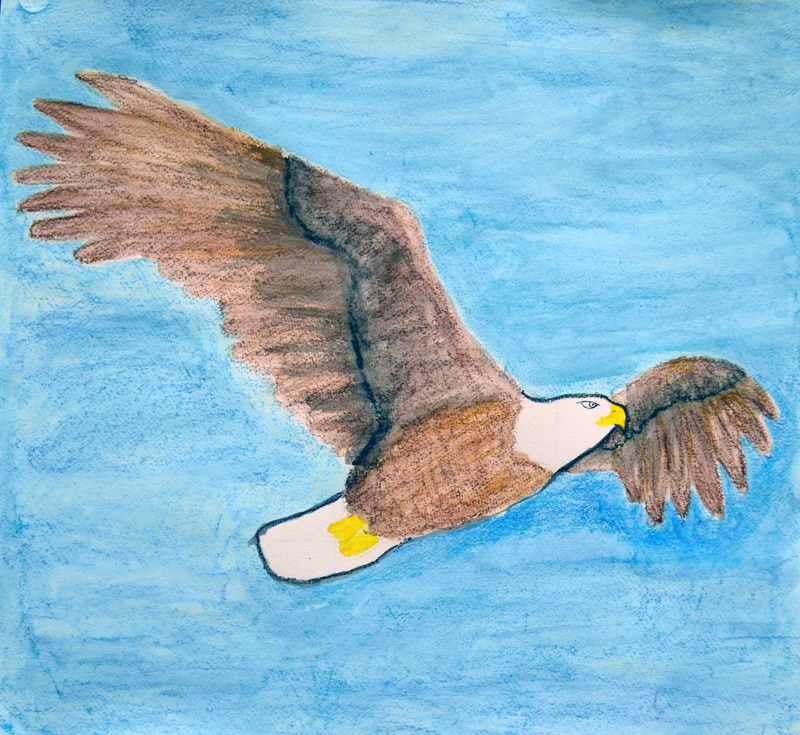 I came up with this lesson by reinventing a project I saw on Create Art With Me! I usually shy away from showing my students a teacher example, especially at the beginning of a project. It can make them feel like that is the goal, and sometimes it keeps them from trying something new. But I have noticed that my 2nd graders need to see how the process is going to work. So, with this project I showed them my example, but I told them that they could make a lot of “artist decisions” for their artwork. They got to choose if their hand was opened or closed. They decided if they wanted to cut out one hand or two. When it was time to print their hand, they chose where and how to place it. The results were so much fun! Everyday I was excited to see how my students interpreted the project in their own way. 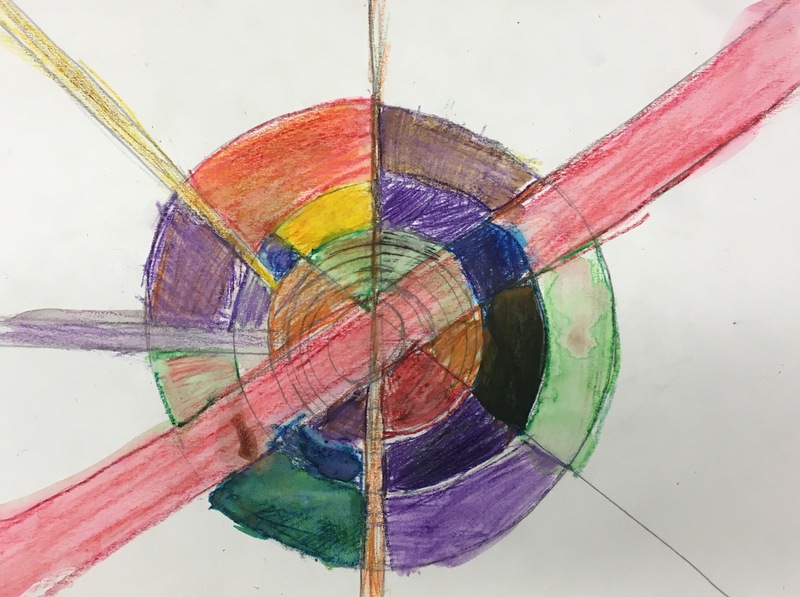 About half the class decided to create a piece of art that was similar to my example. Which is why I think of this process as “encouraging creativity.” You can create an atmosphere that is conducive to trying new things, but it’s up to the students to decide when they feel comfortable and ready to try something different. Creativity isn’t something you can force! The other thing I loved about this project is that it was a chance for kids to practice their fine motor skills. Projects or assignments that are only about cutting can be frustrating for 2nd graders. They need the practice, but it helps if that experience comes with learning about something new, like printmaking. And who doesn’t love having paint rolled onto their hand!